Posted on December 13, 2010 by Ray Williams (NMLS #216267). Last Week in Review: Are rates going to come back? Here’s a break down of possible scenarios! Forecast for the Week: Get ready for a busy week. Find out what you should watch. View: Know someone in college or headed there soon? Watch the video below for tips to avoid unexpected college costs. “Where do we go from here?” That question from Alicia Keys’ song is on the minds of many Americans, as they wonder where home loan rates are headed after the recent negative news for Bonds. Last week, Congress was busy at work on negotiations to extend the Bush-era tax cuts. That news kept a lid on any improvement for Bonds and home loan rates, due to the prospect of an ever-increasing deficit. And adding to the troubles for Bonds and home loan rates last week was news that inflation is growing in China… and growing fast. How does that impact us? Remember, it’s a global economy, so Bond prices all over the world worsen on news of inflation, which is bad for home loan rates. So the big question is: Will home loan rates go back down? If the tax cut package doesn’t get passed, it would be very bad news for the economy and Stock market – but it would help interest rates. If the Fed’s recent round of Quantitative Easing falls on its face and doesn’t meet its mission of creating inflation, boosting Stock prices, lowering unemployment and creating consumer demand – Bond prices could make some gains as the threat of deflation reemerges. But this is a long shot. If the financial problems in Europe worsen significantly – which would drive investors into the safe haven of the US Bond market – it could help Bond prices, but probably only modestly. Realistically, the chances of these events happening are unlikely – and in the end, rates may see some brief and fleeting improvements, but many experts believe they will likely continue to creep up over time. And when you include the stimulative action of extending the present tax rates and adding further cuts, it’s tough to see Bonds or home loan rates improving much. The good news is that home loan rates are still extremely attractive and are still near historic lows for now. If you or someone you know has been thinking about purchasing or refinancing a home, NOW is the time to call or email to get started. Get ready for a busy week of economic reports and news that could impact home loan rates! We’ll start off Tuesday morning with the Retail Sales report for November, as well as the Fed’s final FOMC Meeting and Policy Statement of the year coming on Wednesday. We’ll also see new inflation reports starting on Tuesday with the Producer Price Index (PPI), which measures inflation at the wholesale level. The very next day, we’ll see the Consumer Price Index (CPI) with a look at inflation on the consumer level. With all of the recent talk over inflation concerns in the future, it will be important to see what these reports reveal – since inflation is the archenemy of Bonds and home loan rates. We’ll also get a dose of manufacturing news in the Empire State Index, which looks at New York State’s manufacturing sector, and is a good gauge of manufacturing overall. On Thursday, we’ll also see the Philadelphia Fed Index, which is another important manufacturing report. Those two indices have the potential to impact the market, since they indicate the health of the manufacturing sector in the US. Thursday brings the Initial and Continuing Jobless Claims Report. Last week, Initial Jobless Claims came in at 421,000, which was below expectations. That was encouraging news, but we still need to see consistent readings below 400,000 before real confidence in the labor market can take hold. Finally, we’ll see more housing news this week, when reports on Housing Starts and Building Permits in November are released on Thursday. 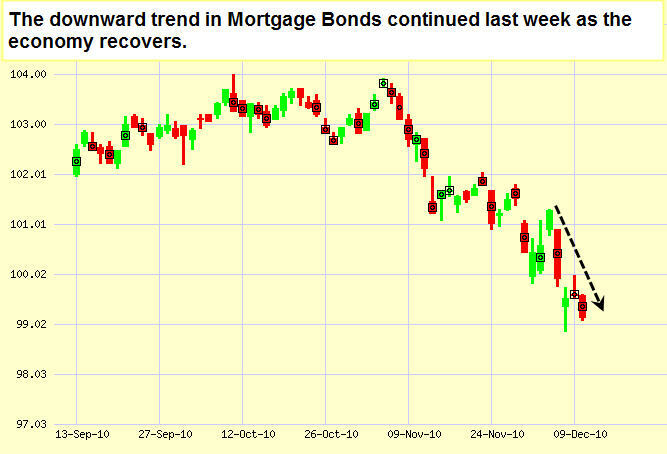 The chart below shows the recent direction of Bonds – and, therefore, home loan rates. The important thing to note is the downward trend, which shows how Bond pricing and therefore home loan rates continued to worsen last week. Fortunately, there’s still time to lock in at near historic lows. It only takes a few minutes to see if this makes sense for you, or one of your friends, family members, neighbors, clients or coworkers. Call or email today, and I’ll be happy to help right away. College tuition costs are staggering these days – and so are some of the college-related expenses that you may not be expecting. Watch this video from Kiplinger.com on unexpected college expenses to come up with ways to avoid those indirect costs. Whether you’re planning to send a child to college soon or you know a student in college this year that has already experienced some of these unexpected costs, this video is invaluable!